“The Shack“, by Wm. Paul Young. Several years ago, I led a six week book review at my church on “The Shack.” Last week I was asked to speak at a book club on the same book which has come into focus again with the recent release of the movie made from the book. Preparing for my talk and discussion, I asked myself, how can I reduce such a rich book to an hour speech? I saw the movie, reviewed the book again, and reached deep into the text to pull out some of its jewels of thought provoking questions. Although it is a fiction story, it invokes questions such as who is God? Does He really care for us? How am I to respond to Him? If I have suffered a great loss, an unspeakable tragedy, does God care? And what do I do with my anger, hate and resentment? Here are snippets of that book feature I did on my blog site, in May of 2015. During Mack’s weekend with God, Jesus and the Holy Spirit, he is confronted with his anger towards God, his personal guilt for not what happened to his daughter, and his desire for retribution. 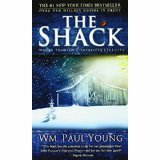 “The Shack,” is a powerful book that challenges our perceptions of God, redemption, grace and forgiveness and gives pause to our usual responses to life. Originally written for his children, others who read Paul’s story encouraged him to publish it. A couple of years ago, I had the opportunity to facilitate a book review group of this book as part of a Lenten series at my church. Although I had read the book before, this was an in-depth study rich in revelations and take away lessons that could deepen our faith and walk with God. A couple of months later, I was privileged to meet, talk with and listen to the author himself when he spoke at our church. Many people begin the book but never complete it. I encourage you to not only read it from beginning to end, and take time to pursue its deeper messages of grace, redemption, forgiveness and love, but also to make it a part of your own library. Post Script – Go see the movie – it faithfully follows the book and is a good see.